Here are 10 ways to help protect your child from germs, illness, and sickness at school. Know How and When to Wash Hands: Children often don’t wash their hands often enough or well enough at school. In one study of middle and high school students, about half washed their hands after using the bathroom. Washing hands can prevent sickness. Teach Your Child Germ Etiquette: Teach your child to stay away from sick children as much as possible. “When children see another child hacking or sneezing, they should move away. Build Immunity: Help protect your child from inside as well as out. Make sure that he/she gets enough sleep and exercise, avoids stress, and eats has a well-balanced diet. Stay home when sick: If possible, stay home from school when you are sick. This will help prevent spreading your illness to others. Use hand sanitizer: It is a good idea to clean shared equipment, desks, or food trays with hand sanitizer to kill any germs that might be lurking there. Apply it liberally to your skin, and then rub your hands together thoroughly until they are completely dry. Avoid sharing food or drinks: Although it might feel impolite to refuse your friend a sip of your soda, this is a great way to spread germs. Use care when using a drinking fountain: Some students put their mouths directly on the faucet, passing along their colds and flu to the next person in line. If you want to be even safer, have your child carry their own water bottle instead. 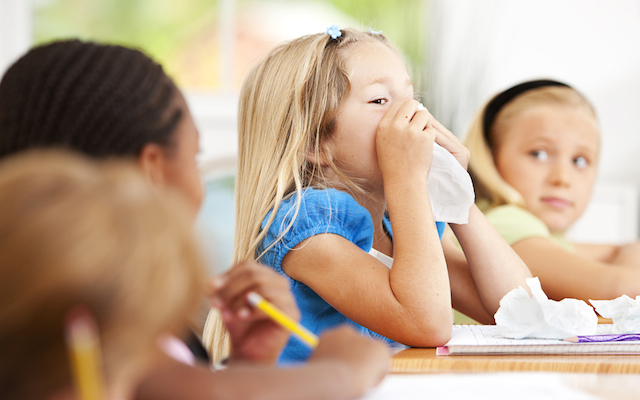 Send functional tissues to school with your child: Encourage your child to cover his nose or mouth when sneezing or coughing and after using a tissue, throw it away. Get Immunized: Make sure your child is up to date on scheduled immunizations and that everyone in the family has gotten a seasonal flu vaccine.